Foreigners fearing strikes by terrorists in Saudi Arabia will be allowed to carry guns, the police minister announced, following a rash of militant bombings, attacks and kidnappings targeting Western workers in the Gulf kingdom. "In principle, a citizen has the right to carry a licensed weapon, and so does the resident, if he senses danger he can carry a personal weapon as he does in his country," Prince Nayef said in the first such announcement during a press conference late Wednesday. A Western diplomat had said some embassies and foreign companies had asked Saudi authorities to ease rules barring private security guards from carrying weapons. Nayef's comment appeared to be a response to such requests. A Western diplomat reached Thursday, a weekend day in Saudi Arabia, said diplomats had not yet been advised of the details but that it appeared to be a positive step. Under Saudi law, foreigners — even security guards — cannot have weapons, while Saudis must apply for a permit. Nayef's comments suggested foreigners would now be allowed to seek permits, though he did not elaborate. Saudi officials have not said when such measures will come into being. Al-Qaeda-linked militants in Saudi Arabia have hiked up their campaign of attacks, targeting foreign workers with a bloody assault on a Riyadh housing compound in May that killed 22 people, a series of shootings and the kidnapping-beheading of an American hostage. The bloodshed has spread fear among foreign expatriates who form a key labor force. An estimated 8.8 million foreigners work among 17 million Saudis in the kingdom. Most hold low-skill jobs, but many work in the oil, banking and other vital sectors. 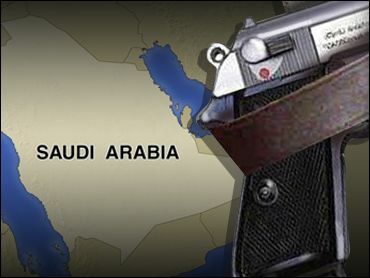 Westerners working in Saudi contacted by The Associated Press had mixed reactions to the possibility of being able to carry firearms. "I like the concept, I think its a great idea, but I hope they implement this quickly," said Jack Smith, an IT manager from St. Louis, Missouri, living in the Saudi capital, Riyadh. Smith, a gun license holder in the United States, warned that people unfamiliar with weapons should be trained before being allowed to own guns. "There's a lot of twitchy foreigners out there and it could be a bigger problem if they are suddenly given a weapon in a moderately threatening situation," he said in a telephone interview. Another American working in western Saudi Arabia, who only wanted to be identified by his first name, Bob, welcomed the move, but urged caution in legalizing weapon ownership. "There are many bad examples of people owning guns in the States and we don't want to have the same situation here," said the engineer. Another Western diplomat said a group of Western ambassadors will meet Saudi Foreign Minister Prince Saud on Sunday in the Red Sea port city of Jiddah to discuss foreigners' security. Nayef, the police minister, also urged wanted militants to take up an amnesty offer made by the kingdom's rulers, "or else they will face a stronger and tougher method." Crown Prince Abdullah, the kingdom's de facto ruler, issued the ultimatum Wednesday in the name of King Fahd, his ailing half brother, for anyone not yet "arrested for carrying out terrorist acts." Nayef said only those who committed acts that hurt others would be prosecuted, and no one who turns himself in would face the death penalty. Late Thursday, the Interior Ministry issued a statement saying a wanted militant surrendered to police "hours after" the amnesty announcement. Saaban bin Mohamed bin Abdullah Alleihi al-Shihri, who has been in hiding for almost two years, was wanted in connection with a "security-related case," the statement said without elaborating. His name does not appear on a list of 26 most wanted Saudis sought in relation to terror attacks. The statement said al-Shihri can remain with his family until investigations begin. Nayef has said the amnesty would also apply to two men who surrendered before the announcement, Ali Abd al-Rahman al-Faqasi al-Ghamdi and Mansour Mohammed Ahmed Faqih, who turned themselves in, in June and December 2003 respectively. Police on Thursday resumed searches in Riyadh's ultraconservative Suweidi neighborhood and several other districts for militants, conducting house-to-house hunts for suspects and advising families with children to leave the area for security reasons. Suweidi, in the capital's south, has been the scene of numerous confrontations between government forces and militants. The wave of violence began May 12, 2003, when car bombs targeted three compounds housing foreign workers in Riyadh, killing 35 people, including nine suicide bombers. Since then, the kingdom has suffered a series of suicide bombings, gunbattles and kidnappings. The latest attack was the beheading of American engineer Paul M. Johnson Jr., who was kidnapped in Riyadh on June 12. There are fears the violence, which has had a particularly vicious edge with the beheading and the dragging of some victims behind cars, could drive out American and other Western workers vital to Saudi Arabia's oil and other industries. Nayef said Saudi authorities are still searching for Johnson's body. Neighboring Bahrain stationed extra police officers on the 25-kilometer (15-mile) causeway linking the island state to Saudi Arabia and coast guard vessels patrolled the water nearby. A Bahraini security official said the government was taking the steps in response to the Saudi attacks. Some oil workers have begun moving to Bahrain from Saudi Arabia.